In some families aviation seems to run in their blood. Cliff's father Captain Raymond Pike flew for SAA, starting on the DC10 and then as then as the age of the Boeing's dawned he flew the iconic 707 as well as the 727, 737 and the legendary Jumbo, the 747 until his retirement in 1987. “Flying was always part of my family but I chose to be a soccer player and business man before I started flying.” Cliff said. Unlike most young budding aviators who chose to spend their time at airfields or building models Cliff started playing soccer at the age of nine and soon was chosen to represent the then Eastern Transvaal in the Soccer Curry Cup which he did every year until 1986 when he was awarded the Curry Cup Golden Boot award and in the same year he turned professional joining Grinaker Rangers. “Alex Forbes, the Scotland International player was our coach and our home ground was the Rand Stadium, south of Johannesburg.” Cliff said. His most treasured possession still is the NPL League winners Gold Medal. In 1984 between soccer and business Cliff started his PPL and after six hours of instruction he was send solo by another legend, Sluggy Lugg at Brakpan Flight School. Today he has well 2500 hours in his log book of which more than 400 was on a 2/3rd scale Mustang MII taildragger build by Tony Merry of Margate. “I bought it in 1989 and all I did was to improve the interior and had had loads of fun in it but sadly had to sell it in 1996. The new owner repainted it and then on his first flight had an accident and totalled it!” Cliff recalled. Also on Cliff's licence are the Cessna 401 and Seneca PA-34-T as well as the Pitts S-2A in which in 2007 under Captain Ken Rossouw he got his aerobatic rating. “I flew the Pitts in aerobatic competitions until 2011 but it just did not have enough power in our high altitudes.” Cliff said. 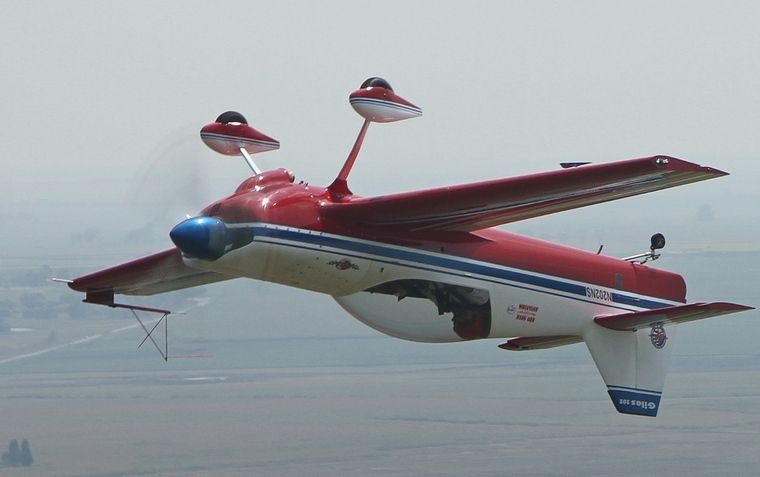 The carbon fibre composite Giles 202 that had its first flight in December 1995 with Lew Shattuck at the control is a two seat unlimited aerobatic aircraft designed by Richard Giles. It was the hottest and most affordable two seat aerobatic aircraft available at that time when the Extra reigned supreme. The Giles was the forerunner of a new generation of aerobatic aircraft spawning legends like the French CAP 222 and the MX2. “The performance of this airplane is absolutely amazing. The controls are so well harmonised it leaves you speechless. This is a wonderful aerobatic airplane destined to achieve great thing.” Lloyd Beaule, Canadian Aerobatic Champion said of the Giles. The Giles has a wing span of 22 ft (6.71 m), length of 19 ft 4 in (5.89 m) and empty weights 980 lb (445 kg). Maximum take off weight is 1,600 lb (726 kg). The 202 powered by the235 hp Lycoming AEIO-360 and fitted with the 3 bladed MT propeller has been tested to 260 knots (482 k/ph) but the red line is 230 knots (267 mph, 426 k/ph). Cruise is 175 knots (201 mph, 324 k/ph) burning 10 gal (37.8 l)/hour. Fuel capacity is 58 gal (219.5 l). For aerobatic flight the limit is 10 gal (37.8 l). The roll rate is in excess of 400 degrees per second, and the aileron spades can be manually adjusted to change the roll rate or change the control feel to greater or lesser values. It was designed to 24 g, but limited to 10 g.
Cliff's daughter Kayley inherited the aviation gene and is following in the footsteps of her father and grandfather. Kayley got her PPL at age at 21 on the 20 January 2011 with Aaron at Aviator Training Academy at Springs air field as her instructor and fittingly she expertly flew the chase plane for the photo shoot and who knows, soon we may have another Pike competing in aerobatics.